Italian designer Horacio Bozzo of AXIS Group Yacht Design has penned a spacious 27m expedition yacht for Chinese yard Kingship. Because the waterline length of the steel hull and aluminium Discovery 88 design falls under 24m, the yard notes that she is obliged to carry only a minimal number of crew – a captain and deckhand, although four can be accommodated. As well as saving on staffing costs, having a small crew means more interior space is apportioned to guest accommodation. This includes three lower deck guest cabins (one full-beam) plus a full-beam master cabin. A beam of 8m makes the design’s combined main saloon and dining saloon a spacious entertaining area, served from an adjacent galley. The dining area aft is planned as a particularly pleasant spot, with shelving for objects d’art and glass doors to the aft deck bringing light inside. 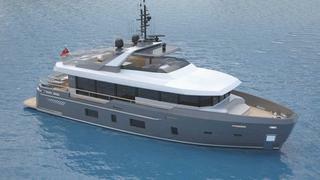 The flybridge will be partially shaded by a hard-top and features sunbeds, a barbecue, bar and dining table. The Discovery 88 will be powered by two Caterpillar C12’s engines, each delivering 290kW at 1,800 rpm and an expected range of 3,500nm at 10 knots. A scale model of the design will be on show at the Monaco Yacht Show between 25 and 28 September at QD 20, Darse Nord.